PRTG Network Monitor makes it easy to monitor and categorize a network's bandwidth usage. Network administrators will have access to real time data as well as long-term usage trends for all network devices. PRTG's free bandwidth meter is its most commonly used feature, but this powerful software also monitors many other aspects of your network including memory and resource consumption. The free network monitor will help you in optimizing your network's efficiency by supplying you with the most accurate bandwidth and network usage data. It runs 24 hours a day, constantly recording network usage data which it stores on an internal database for later analysis. This data will give you precise load information for all network applications and servers, which will allow you to avoid troublesome bandwidth and server performance bottlenecks. It will also become a cost-saving device as it will allow you to make more educated bandwidth and hardware purchasing decisions, buying only what you need based on actual network load data. With PRTG's easy-to-use web interface, you can configure the sensors monitoring your network, as well as create custom usage reports. In addition, PRTG's built-in web server provides remote access to graphs and tables. This free bandwidth meter supports the most common methods for network usage data acquisition: SNMP, Packet Sniffing and NetFlow. 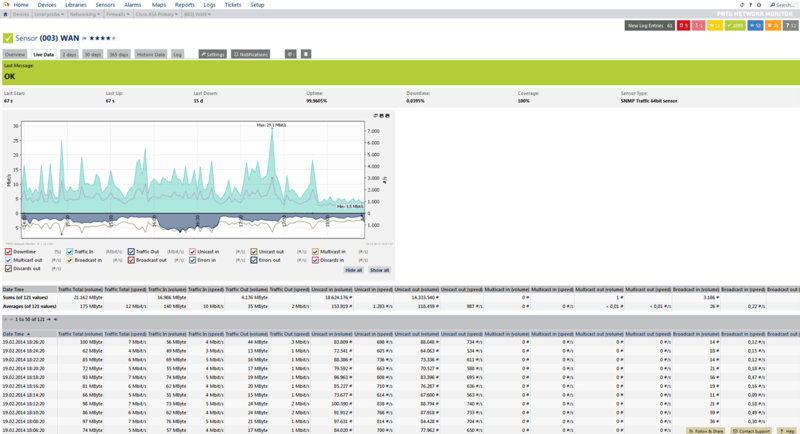 PRTG Network Monitor is available in two editions. The Freeware Edition may be downloaded and used for personal and commercial use completely free of charge. The Commercial Editions are required if you want to monitor more than 100 sensors. Download your copy of PRTG now to see why more than 200,000 customers around the world use our free bandwidth meter every day to ensure optimal network performance.